Some months back I bought some fabric that I intended to have made into a Marian chasuble. When I finally took it to The House of Hansen a few weeks ago, it occurred to me that I ought to have some of it used on a dalmatic, as well. The salesman wasn't sure if I had enough material for both a chasuble and a dalmatic so he called out one of her seamstresses. She measured the fabric many times and played around with a few ideas, bouncing them off of the salesman and me. In the end, I wasn't quite sure what she had in mind, but she was confident she could pull it off. The salesman called on Friday to tell me the vestments had been finished and the gold galloon I had selected helped make them beautiful. Naturally, I was pleased to hear and was told the vestments would be shipped Monday. They arrived today. Now I almost wish I had a Saturday morning Mass so I could use them soon. The good folks at Catholic Vote Action have introduced a petition to Sr. Carol Keehan and the Catholic Health Association to support the bipartisan Protect Life Act that would actually prohibit federal taxpayer dollars from funding abortion. Pope: "Communion with Peter...is the guarantee of freedom"
Over at Whispers in the Loggia, Rocco has the translation of the Holy Father's homily for the Mass in honor of the Solemnity of Saints Peter and Paul, during which he bestowed the pallium on the recently appointed Metropolitan Archbishops. The biblical texts of this Eucharistic Liturgy of the Solemnity of Saints Peter and Paul, in their great wealth, highlight a theme that could be summarized thus: God is close to his faithful servants and frees them from all evil, and frees the Church from negative powers. It is the theme of the freedom of the Church, which has a historical aspect and another more deeply spiritual one. This theme runs through today's Liturgy of the Word. The first and second readings speak, respectively, of St Peter and St Paul, emphasizing precisely the liberating action of God in them. Especially the text from the Acts of the Apostles describes in abundant detail the intervention of the Angel of the Lord, who releases Peter from the chains and leads him outside the prison in Jerusalem, where he had been locked up, under close supervision, by King Herod (cf. at 12.1 to 11). Paul, however, writing to Timothy when he feels close to the end of his earthly life, takes stock which shows that the Lord was always near him and freed him from many dangers and frees him still by introducing him into His eternal Kingdom ( see 2 Tim 4, 6-8.17-18). The theme is reinforced by the Responsorial Psalm (Ps 33), and also finds a particular development in the Gospel of Peter's confession, where Christ promises that the powers of hell shall not prevail against his Church (cf. Mt 16:18). Observing closely we note a certain progression regarding this issue. In the first reading a specific episode is narrated that shows the Lord's intervention to free Peter from prison. In the second Paul, on the basis of his extraordinary apostolic experience, is convinced that the Lord, who already freed him "from the mouth of the lion "delivers him" from all evil", by opening the doors of Heaven to him. In the Gospel we no longer speak of the individual Apostles, but the Church as a whole and its safekeeping from the forces of evil, in the widest and most profound sense. Thus we see that the promise of Jesus - "the powers of hell shall not prevail" on the Church – yes, includes the historical experience of persecution suffered by Peter and Paul and other witnesses of the Gospel, but it goes further, wanting to protect especially against threats of a spiritual order, as Paul himself writes in his Letter to the Ephesians: " For our struggle is not with flesh and blood but with the principalities, with the powers, with the world rulers of this present darkness, with the evil spirits in the heavens"(Eph 6:12). Indeed, if we think of the two millennia of Church history, we can see that - as the Lord Jesus had announced (cf. Mt 10.16-33) – Christians have never been lacking in trials, which in some periods and places have assumed the character of real persecution. These, however, despite the suffering they cause, are not the greatest danger for the Church. In fact it suffers greatest damage from what pollutes the Christian faith and life of its members and its communities, eroding the integrity of the Mystical Body, weakening its ability to prophesy and witness, tarnishing the beauty of its face. This reality is already attested in the Pauline Epistle. The First Epistle to the Corinthians, for example, responds to some problems of divisions, inconsistencies, of infidelity to the Gospel which seriously threaten the Church. But the Second Letter to Timothy – of which we heard an excerpt - speaks about the dangers of the "last days", identifying them with negative attitudes that belong to the world and can infect the Christian community: selfishness, vanity, pride, love of money, etc. (cf. 3.1 to 5). The Apostle’s conclusion is reassuring: men who do wrong - he writes - "will not make further progress, for their foolishness will be plain to all" (3.9). There is therefore a guarantee of freedom promised by God to the Church, it is freedom from the material bonds that seek to prevent or coerce mission, both through spiritual and moral evils, which may affect its authenticity and credibility. The theme of the freedom of the Church, guaranteed by Christ to Peter, also has a specific relevance to the rite of the imposition of the pallium, which we renew today for thirty-eight metropolitan archbishops, to whom I address my most cordial greeting, extending with it affection to all who have wanted to accompany them on this pilgrimage. Communion with Peter and his successors, in fact, is the guarantee of freedom for the Church's Pastors and the Communities entrusted to them. It is highlighted on both levels in the aforementioned reflections. Historically, union with the Apostolic See, ensures the particular Churches and Episcopal Conferences freedom with respect to local, national or supranational powers, that can sometimes hinder the mission of the ecclesial Church. Furthermore, and most essentially, the Petrine ministry is a guarantee of freedom in the sense of full adherence to truth and authentic tradition, so that the People of God may be preserved from mistakes concerning faith and morals. Hence the fact that each year the new Metropolitans come to Rome to receive the pallium from the hands of the Pope, must be understood in its proper meaning, as a gesture of communion, and the issue of freedom of the Church gives us a particularly important key for interpretation. This is evident in the case of churches marked by persecution, or subject to political interference or other hardships. But this is no less relevant in the case of communities that suffer the influence of misleading doctrines or ideological tendencies and practices contrary to the Gospel. Thus the pallium becomes, in this sense, a pledge of freedom, similar to the "yoke" of Jesus, that He invites us to take up, each on their shoulders (Mt 11:29-30). While demanding, the commandment of Christ is "sweet and light" and instead of weighing down on the bearer, it lifts him up, thus the bond with the Apostolic See – while challenging – sustains the Pastor and the portion of the Church entrusted to his care, making them freer and stronger. I would like to draw a final point from the Word of God, in particular from Christ's promise that the powers of hell shall not prevail against his Church. These words may also have a significant ecumenical value, since, as I mentioned earlier, one of the typical effects of the Devil is division within the Church community. The divisions are in fact symptoms of the power of sin, which continues to act in members of the Church even after redemption. But the word of Christ is clear: " Non praevalebunt – it will not prevail" (Matt. 16:18). The unity of the Church is rooted in its union with Christ, and the cause of full Christian unity - always to be sought and renewed from generation to generation - is well supported by his prayer and his promise. In the fight against the spirit of evil, God has given us in Jesus the 'Advocate', defender, and after his Easter, "another Paraclete" (Jn 14:16), the Holy Spirit, which remains with us always and leads the Church into the fullness of truth (cf. Jn 14:16; 16:13), which is also the fullness of charity and unity. With these feelings of confident hope, I am pleased to greet the delegation of the Patriarchate of Constantinople, which, in the beautiful custom of reciprocal visits, participates in the celebrations of the patron saints of Rome. Together we thank God for progress in ecumenical relations between Catholics and Orthodox, and we renew our commitment to generously reciprocate to God's grace, which leads us to full communion. Dear friends, I cordially greet all of you: Cardinals, Brother Bishops, Ambassadors and civil authorities, in particular the Mayor of Rome, priests, religious and lay faithful. Thank you for your presence. May the Saints Peter and Paul help you to grow in love for the holy Church, the Mystical Body of Christ the Lord and messenger of unity and peace for all men. May they also help you to offer the hardships and sufferings endured for fidelity to the Gospel with joy for her holiness and her mission. May the Virgin Mary, Queen of Apostles and Mother of the Church, always watch over you and especially over the Ministry of metropolitan archbishops. With her heavenly help may you always live and act in that freedom that Christ has won for us. Amen. Pope: "The Church is young, and open to the future"
With the celebration of the first vespers we enter into the solemnity of Sts. Peter and Paul. We have the grace of doing so in the Papal Basilica named after the Apostle to the Gentiles, recollected in prayer near his tomb. Because of this, I would like to focus my brief reflection on the perspective of the missionary vocation of the Church. In this line are the third antiphon of the psalm that we prayed and the biblical reading. The first two antiphons are dedicated to St. Peter, the third to St. Paul and it says: "You are the messenger of God, Holy Apostle Paul: you proclaimed the truth in the whole world." And in the brief reading, which treats of the initial direction of the Letter to the Romans, Paul introduces himself as "called to be an apostle, set apart for the Gospel of God" (Romans 1:1). Paul's figure, his person and his ministry, his whole existence and his hard work for the Kingdom of God, are completely dedicated to the service of the Gospel. Perceived in these texts is a sense of movement, where the protagonist is not man, but God, the breath of the Holy Spirit, which drives the Apostle onto the roads of the world to take the Good News to all: the promises of the prophets are fulfilled in Jesus, the Christ, the Son of God, who died for our sins and rose for our justification. Saul is no longer, Paul is, and what is more, it is Christ who lives in him (cf. Galatians 2:20) and wishes to gather all men. If then the feast of the Holy Patrons of Rome evokes the twofold tension between unity and universality that typifies this Church, the context in which we find ourselves this evening calls us to favor the second, allowing ourselves, so to speak, to be won over by St. Paul and by his extraordinary vocation. When he was elected Successor of Peter, at the height of the unfolding of the Second Vatican Council, the Servant of God Giovanni Battista Montini chose to bear the name of the Apostle to the Gentiles. Within his program of action of the Council, in 1974 Paul VI convoked and assembly of the Synod of Bishops on the topic of evangelization in the contemporary world, and about a year later he published the apostolic exhortation "Evangelii Nuntiandi," which opens with these words: "There is no doubt that the effort to proclaim the Gospel to the people of today, who are buoyed up by hope but at the same time often oppressed by fear and distress, is a service rendered to the Christian community and also to the whole of humanity" (No. 1). The timeliness of this expression is striking. Perceived in it is all the particular missionary sensibility of Paul VI and, through his voice, the great conciliar yearning to evangelize the contemporary world, a yearning that culminated in the decree "Ad Gentes," but which permeates all the documents of Vatican II and that, even earlier, animated the thought and work of the council fathers, gathered to represent, in a way never before so tangible, the worldwide diffusion reached by the Church. Words are not adequate to explain how the Venerable John Paul II, in his long pontificate, developed this missionary projection, which -- it is always recalled -- responds to the nature itself of the Church, which with St. Paul can and must always repeat: "For if I preach the Gospel, that gives me no ground for boasting. For necessity is laid upon me. Woe to me if I do not preach the Gospel! (1 Corinthians 9:16). Pope John Paul II presented "live" the missionary nature of the Church, with the apostolic journeys and with the insistence of his magisterium on the urgency of a "new evangelization": "new" not in the contents, but in the interior impulse, open to the grace of the Holy Spirit who constitutes the force of the new law of the Gospel and who always renews the Church; "new" in the search of ways that correspond to the force of the Holy Spirit and are adapted to the times and the situations; "new" because necessary also in countries which have already received the proclamation of the Gospel. Evident to all is that my predecessor gave an extraordinary impulse to the mission of the Church, not only -- I repeat -- by the distances covered by him, but above all by the genuine missionary spirit that animated him and that he left in legacy at the dawn of the third millennium. Taking up this legacy, I have been able to affirm, at the beginning of my Petrine ministry, that the Church is young, and open to the future. And I repeat it today, near the sepulcher of St. Paul: The Church is an immense force of renewal in the world, not because of her strength, but because of the force of the Gospel, in which the Holy Spirit of God breathes, the God Creator and Redeemer of the world. The challenges of the present age are certainly beyond human capacities; they are the historical and social challenges, and with greater reason, the spiritual challenges. At times it seems to us pastors of the Church that we are reliving the experience of the Apostles, when thousands of needy persons followed Jesus, and he asked: What can we do for all these people? They then experienced their impotence. But Jesus had in fact demonstrated to them that with faith in God nothing is impossible, and that a few loaves and a few fish, blessed and shared, could satiate all. But it was not -- and is not -- only hunger for material food: There is a more profound hunger, which only God can satiate. Man of the third millennium also desires an authentic and full life, he has need of truth, of profound liberty, of gratuitous love. Also in the deserts of the secularized world, man's soul thirsts for God, for the living God. Because of this John Paul II wrote: "The mission of Christ the Redeemer, entrusted to the Church, is still very far from its fulfillment," and he added: "a look on the whole of humanity demonstrates that such a mission is still at the beginning and that we must commit ourselves with all our strength to its service" ("Redemptoris Missio," No. 1). There are regions in the world that still wait for a first evangelization; others that received it but need more profound work; others still in which the Gospel put down roots a long time ago, giving place to a true Christian tradition, but where in the last centuries -- with complex dynamics -- the process of secularization has produced a grave crisis of the sense of the Christian faith and of belonging to the Church. In this perspective, I have decided to create a new organism, in the form of pontifical council, with the specific task of promoting a renewed evangelization in countries where the first proclamation of the faith already resounded, and where Churches are present of ancient foundation, but which are going through a progressive secularization of society and a sort of "eclipse of the sense of God," which constitutes a challenge to find the appropriate means to propose again the perennial truth of the Gospel of Christ. Dear brothers and sisters, the universal Church faces the challenge of the new evangelization, which asks us also to continue with commitment the search for the full unity among Christians. An eloquent sign of hope in this connection is the custom of the reciprocal visits between the Church of Rome and that of Constantinople on the occasion of the feasts of their respective patron saints. Because of this, today we welcome with renewed joy and gratitude the delegation sent by Patriarch Bartholomew I, to whom we address the most cordial greeting. May the intercession of Sts. Peter and Paul obtain for the whole Church ardent faith and apostolic courage, to proclaim to the world the truth of which we all have need, the truth that is God, origin and end of the universe and of history, merciful and faithful Father, hope of eternal life. Amen. Because of this, the structure of this monumental work (cf. Jean Pierre Torrell, La "Summa" di San Tommaso, Milan, 2003, pp. 29-75), research with a "theological look" at the fullness of God (cf. Summa Theologiae, Ia, q. 1, a. 7), is articulated in three parts, and is illustrated by the Doctor Communis himself -- St. Thomas -- with these words: The main purpose of sacred doctrine is that of making God known, not only in himself, but also inasmuch as he is beginning and end of things, and especially of the reasoning creature. In the attempt to explain this doctrine, we will first treat of God; then of the movement of the creature toward God; and finally of Christ who, inasmuch as man, is for us the way to ascend to God" (Ibid., I. q. 2). It is a circle: God in himself, who comes out of himself and takes us by the hand, so that with Christ we return to God, we are united to God, and God will be all in all. Hence, the first part of the Summa Theologiae studies God in himself, the mystery of the Trinity, and God's creative activity. In this part we also find a profound reflection on the authentic reality of the human being inasmuch as he issued from the creative hands of God, fruit of his love. On one hand we are a created, dependent being -- we do not come from ourselves; but, on the other, we have a true autonomy, so that we are not only something apparent -- as some Platonic philosophers say -- but a reality willed by God as such, and with value in itself. I would like to propose some simple, essential and convincing examples of the content of the teaching of St. Thomas. In his booklet on the Symbol of the Apostles he explains the value of faith. Through it, he says, the soul is united to God, and something like a shoot of eternal life is produced; life receives a sure orientation, and we overcome temptations easily. To those who object that faith is nonsense, because it makes one believe something that does not fall under the experience of the senses, St. Thomas gives a very articulated answer, and recalls that this is an inconsistent doubt, because human intelligence is limited and cannot know everything. Only in the case that we could know perfectly all visible and invisible things, would it then be genuine nonsense to accept truths purely on faith. However, it is impossible to live, St. Thomas observes, without trusting the experience of others, where personal knowledge does not reach. Hence it is reasonable to have faith in God who reveals himself and in the testimony of the Apostles: they were few, simple and poor, dismayed by the Crucifixion of their Teacher; and yet many wise, noble and rich persons were converted in a short time upon listening to their preaching. It is, in fact, a historically striking phenomenon, to which with difficulty one can give any other reasonable answer, other than that of the Apostles' encounter with the Risen Lord. Commenting on the article of the Symbol regarding the incarnation of the Divine Word, St. Thomas makes some considerations. He affirms that Christian faith, when it considers the mystery of the incarnation, is reinforced; hope rises more trustingly, with the thought that the Son of God came among us, as one of us, to communicate to men his own divinity; charity is revived, because there is no more evident sign of the love of God for us than seeing the Creator of the universe make himself a creature, one of us. Finally, considering the mystery of the incarnation of God, we feel our desire inflamed to reach Christ in glory. Using a simple and effective analogy, St. Thomas observes: "If the brother of a king was far away, he certainly would long to live next to him. Well, Christ is our brother: hence, we must desire his company, become one heart with him" (Opuscoli teologico-spirituali, Rome, 1976, p. 64). As Bishop of this Diocese I am particularly glad to welcome 14 new Priests into the "presbyterium" of Rome. Together with the Cardinal Vicar, the Auxiliary Bishops and all the Priests, I thank the Lord for the gift of these new pastors of the People of God. I would like to address a special greeting to you, beloved ordinands: today you are the centre of attention of the People of God, symbolically represented by the people who fill this Vatican Basilica. They fill it with their prayers and their singing, with their sincere and deep affection, their authentic emotion, their human and spiritual joy. Among this People of God a special place is reserved for your parents and relatives, your friends and companions, the Superiors and teachers at your Seminaries, the various parish communities and the different sectors of the Church from which you come and which have accompanied you on your journey, as well as those to whom you have already offered your pastoral service. Nor should we forget the unique closeness, at this moment, of many other people, humble and simple but great before God such as, for example, the cloistered women religious, the children, the sick and the infirm. They accompany you with the very precious gift of their prayers, their innocence and their suffering. Thus today it is the whole Church of Rome which is giving thanks and praying for you, which puts such great trust and hope in your future, which expects abundant fruits of holiness and good from your priestly ministry. Yes, the Church relies on you, she relies very heavily on you! The Church needs each one of you, aware as she is of the gifts that God offers you and, at the same time, of the absolute need in every person's heart to encounter Christ, the one and universal Saviour of the world, to receive from him new and eternal life, true freedom and full joy. We therefore feel we are all invited to enter the "mystery", the event of grace that is being brought about in your hearts with Ordination to the priesthood, letting ourselves be illuminated by the Word of God that has been proclaimed. The Gospel we have heard presents to us an important moment in Jesus' journey, the moment when he asks his disciples what people think of him and their own opinion of him. Peter answers on behalf of the Twelve with a profession of faith substantially different from the people's opinion of Jesus; in fact he says: You are the Christ of God (cf. Lk 9: 20). What is the origin of this act of faith? If we go to the beginning of the Gospel passage, we note that Peter's profession is linked to a moment of Prayer: "as he [Jesus] was praying alone the disciples were with him", St Luke says (9: 18). In other words the disciples become involved in Jesus' absolutely unique being and speaking with the Father. And so it is that they are granted to see the Teacher in his intimate condition as Son, they are granted to see what the others do not see; from "being with him", from "being with him" in prayer, derives a knowledge that goes beyond the people's opinion to reach the profound identity of Jesus, to reach the truth. Here we are given a very precise instruction for the priest's life and mission: he is called to rediscover in prayer the ever new face of his Lord and the most authentic content of his mission. Only those who have a profound relationship with the Lord are grasped by him, can take him to others, can be sent out. "Abiding with him" must always accompany the exercise of the priestly ministry. It must be its central part, even and above all in difficult moments when it seems that the "things that need doing" should have priority, wherever we are, whatever we are doing, we must always "abide with him". I would like to underline a second element of today's Gospel. Immediately after Peter's profession, Jesus announces his Passion and Resurrection and follows this announcement with a teaching concerning the journey of the disciples, which means following him, the Crucified One, and following him on the Way of the Cross. And he then adds with paradoxical words that being a disciple means "losing his life", but in order to save himself fully (cf. Lk 9: 22-24). What does this mean for every Christian, but what does it mean for a priest in particular? Discipleship; yet we can safely say: the priesthood can never be a means of achieving security in life or of acquiring a position in society. Anyone who aspires to the priesthood to enhance his own prestige and power has misunderstood the meaning of this ministry at its root. Anyone who wishes above all to achieve an ambition of his own, to attain success for himself will always be a slave to himself and to public opinion. In order to be esteemed, he must flatter, he must say what people want to hear; he will have to adapt to changing fashions and opinions and will thus deprive himself of the vital relationship with truth, reducing himself to condemning tomorrow what he had praised today. A man who plans his life in this manner, a priest who sees his ministry in these terms does not truly love God and others but only himself and, paradoxically, ends by losing himself. The priesthood let us always remember is based on having the courage to say "yes" to another will, in the awareness that we are growing every day, that precisely by conforming to God's will, by "immersing ourselves" in this will, not only will our own originality not be obliterated, but on the contrary, we will penetrate ever more deeply into the truth of our being and our ministry. Dear Ordinands, I would like to propose for your reflection a third thought, closely linked to what I have just explained: Jesus' invitation to "lose [yourself]", to take up your cross, recalls the mystery we are celebrating: the Eucharist. Today, with the sacrament of Orders, you are granted to preside over the Eucharist! To you is entrusted the redeeming sacrifice of Christ, to you is entrusted his Body given and his Blood poured out. Of course, on the Cross Jesus offers his sacrifice, his gift of humble and total love to the Church his Bride. It is on that wood that the grain of wheat which the Father let fall on the field of the world dies in order to become a ripe fruit, a giver of life. However, in God's plan, Christ's gift of himself is made present in the Eucharist through that potestas sacra, which the sacrament of Orders confers upon you priests. When we celebrate Holy Mass we hold in our hands the Bread of Heaven, the Bread of God, which is Christ, the grain that breaks open in order to increase and to become the true food of life for the world. It is something that cannot but fill you with deep wonder, lively joy and immense gratitude: love and the gift of the Crucified and Glorious Christ now pass through your hands, your voice, your heart! It is an ever new experience of wonder to see that the Lord brings about this mystery of his Presence in my hands, in my voice! So how can we fail to pray the Lord to give you an ever alert and enthusiastic awareness of this gift which is placed at the centre of your being as priests! And to give you the grace of being able to experience in depth the whole beauty and power of this presbyteral service of yours and, at the same time, the grace of being able to live this ministry with consistency and generosity, every day. The grace of the priesthood, which will shortly be given to you, will associate you closely, indeed structurally, with the Eucharist. This is why it will connect you in the depths of your hearts with the sentiments of Jesus who loves to the very end, to the total gift of himself, to the point of his becoming Bread multiplied for the sacred banquet of unity and communion. This is the Pentecostal outpouring of the Holy Spirit, destined to set your heart on fire with the very love of the Lord Jesus. It is an outpouring which, while communicating the absolutely free nature of the gift, sculpts in your being an indelible law the new law, a law that impels you to insert and make flourish anew, in the material context of the attitudes and actions of your every day life, the same love that prompted the self-giving of the Crucified Christ. Let us listen once again to the Apostle Paul's voice, indeed in this voice we recognize the powerful voice of the Holy Spirit: "For as many of you as were baptized into Christ have put on Christ" (Gal 3: 27). Already in Baptism, and now by virtue of the sacrament of Orders, you have put on Christ. May care for the Eucharistic celebration always be accompanied by commitment to a Eucharistic life, namely, a life lived in obedience to one great law, that of love which is given without reserve and serves with humility, a life that the grace of the Holy Spirit renders ever closer to the life of Jesus Christ the Eternal High Priest, Servant of God and of humankind. Dear friends, the path that today's Gospel points out to us is the path of your spirituality and of your pastoral action, of its efficacy and effectiveness, even in the most demanding and arid situations. Furthermore, this is the reliable way to finding true joy. May Mary, the Servant of the Lord who conformed her will to that of God, who brought forth Christ, giving him to the world, who followed the Son even to the foot of the Cross in the supreme act of love, accompany you every day of your life and of your ministry. Thanks to the affection of this tender and strong Mother, you will be able to be joyously faithful to the orders that as priests are being conferred on you today: to conform yourselves to Christ the Priest, who was able to obey the Father's will and to love man to the very end. Today I would like to continue the presentation of St Thomas Aquinas, a theologian of such value that the study of his thought was explicitly recommended by the Second Vatican Council in two documents, the Decree Optatam totius on the Training of Priests, and the Declaration Gravissimum Educationis, which addresses Christian Education. Indeed, already in 1880 Pope Leo XIII, who held St Thomas in high esteem as a guide and encouraged Thomistic studies, chose to declare him Patron of Catholic Schools and Universities. The main reason for this appreciation is not only explained by the content of his teaching but also by the method he used, especially his new synthesis and distinction between philosophy and theology. The Fathers of the Church were confronted by different philosophies of a Platonic type in which a complete vision of the world and of life was presented, including the subject of God and of religion. In comparison with these philosophies they themselves had worked out a complete vision of reality, starting with faith and using elements of Platonism to respond to the essential questions of men and women. They called this vision, based on biblical revelation and formulated with a correct Platonism in the light of faith: "our philosophy". The word "philosophy" was not, therefore, an expression of a purely rational system and, as such, distinct from faith but rather indicated a comprehensive vision of reality, constructed in the light of faith but used and conceived of by reason; a vision that naturally exceeded the capacities proper to reason but as such also fulfilled it. For St Thomas the encounter with the pre-Christian philosophy of Aristotle (who died in about 322 b.c.) opened up a new perspective. Aristotelian philosophy was obviously a philosophy worked out without the knowledge of the Old and New Testaments, an explanation of the world without revelation through reason alone. And this consequent rationality was convincing. Thus the old form of the Fathers' "our philosophy" no longer worked. The relationship between philosophy and theology, between faith and reason, needed to be rethought. A "philosophy" existed that was complete and convincing in itself, a rationality that preceded the faith, followed by "theology", a form of thinking with the faith and in the faith. The pressing question was this: are the world of rationality, philosophy conceived of without Christ, and the world of faith compatible? Or are they mutually exclusive? Elements that affirmed the incompatibility of these two worlds were not lacking, but St Thomas was firmly convinced of their compatibility indeed that philosophy worked out without the knowledge of Christ was awaiting, as it were, the light of Jesus to be complete. This was the great "surprise" of St Thomas that determined the path he took as a thinker. Showing this independence of philosophy and theology and, at the same time, their reciprocal relationality was the historic mission of the great teacher. And thus it can be understood that in the 19th century, when the incompatibility of modern reason and faith was strongly declared, Pope Leo XIII pointed to St Thomas as a guide in the dialogue between them. In his theological work, St Thomas supposes and concretizes this relationality. Faith consolidates, integrates and illumines the heritage of truth that human reason acquires. The trust with which St Thomas endows these two instruments of knowledge faith and reason may be traced back to the conviction that both stem from the one source of all truth, the divine Logos, which is active in both contexts, that of Creation and that of redemption. Together with the agreement between reason and faith, we must recognize on the other hand that they avail themselves of different cognitive procedures. Reason receives a truth by virtue of its intrinsic evidence, mediated or unmediated; faith, on the contrary, accepts a truth on the basis of the authority of the Word of God that is revealed. St Thomas writes at the beginning of his Summa Theologiae: "We must bear in mind that there are two kinds of sciences. There are some which proceed from a principle known by the natural light of the intelligence, such as arithmetic and geometry and the like. There are some which proceed from principles known by the light of a higher science: thus the science of perspective proceeds from principles established by geometry, and music from principles established by arithmetic. So it is that sacred doctrine is a science, because it proceeds from principles established by the light of a higher science, namely, the science of God and the blessed" (ia, q. 1, a.2). Moreover, it is not only faith that helps reason. Reason too, with its own means can do something important for faith, making it a threefold service which St Thomas sums up in the preface to his commentary on the De Trinitate of Boethius: "demonstrating those truths that are preambles of the faith; giving a clearer notion, by certain similitudes, of the truths of the faith; resisting those who speak against the faith, either by showing that their statements are false, or by showing that they are not necessarily true" (q. 2, a.3). The entire history of theology is basically the exercise of this task of the mind which shows the intelligibility of faith, its articulation and inner harmony, its reasonableness and its ability to further human good. The correctness of theological reasoning and its real cognitive meaning is based on the value of theological language which, in St Thomas' opinion, is principally an analogical language. The distance between God, the Creator, and the being of his creatures is infinite; dissimilitude is ever greater than similitude (cf. DS 806). Nevertheless in the whole difference between Creator and creatures an analogy exists between the created being and the being of the Creator, which enables us to speak about God with human words. In the light of this teaching of St Thomas theology says that however limited it may be, religious language is endowed with sense because we touch being like an arrow aimed at the reality it signifies. This fundamental agreement between human reason and Christian faith is recognized in another basic principle of Aquinas' thought. Divine Grace does not annihilate but presupposes and perfects human nature. The latter, in fact, even after sin, is not completely corrupt but wounded and weakened. Grace, lavished upon us by God and communicated through the Mystery of the Incarnate Word, is an absolutely free gift with which nature is healed, strengthened and assisted in pursuing the innate desire for happiness in the heart of every man and of every woman. All the faculties of the human being are purified, transformed and uplifted by divine Grace. An important application of this relationship between nature and Grace is recognized in the moral theology of St Thomas Aquinas, which proves to be of great timeliness. At the centre of his teaching in this field, he places the new law which is the law of the Holy Spirit. With a profoundly evangelical gaze he insists on the fact that this law is the Grace of the Holy Spirit given to all who believe in Christ. The written and oral teaching of the doctrinal and moral truths transmitted by the Church is united to this Grace. St Thomas, emphasizing the fundamental role in moral life of the action of the Holy Spirit, of Grace, from which flow the theological and moral virtues, makes us understand that all Christians can attain the lofty perspectives of the "Sermon on the Mount", if they live an authentic relationship of faith in Christ, if they are open to the action of his Holy Spirit. However, Aquinas adds, "Although Grace is more efficacious than nature, yet nature is more essential to man, and therefore more enduring" (Summa Theologiae, Ia-IIae, q. 94, a. 6, ad 2), which is why, in the Christian moral perspective, there is a place for reason which is capable of discerning natural moral law. Reason can recognize this by considering what it is good to do and what it is good to avoid in order to achieve that felicity which everyone has at heart, which also implies a responsibility towards others and, therefore, the search for the common good. In other words, the human, theological and moral virtues are rooted in human nature. Divine Grace accompanies, sustains and impels ethical commitment but, according to St Thomas, all human beings, believers and non-believers alike, are called to recognize the needs of human nature expressed in natural law and to draw inspiration from it in the formulation of positive laws, namely those issued by the civil and political authorities to regulate human coexistence. When natural law and the responsibility it entails are denied this dramatically paves the way to ethical relativism at the individual level and to totalitarianism of the State at the political level. The defence of universal human rights and the affirmation of the absolute value of the person's dignity postulate a foundation. Does not natural law constitute this foundation, with the non-negotiable values that it indicates? Venerable John Paul II wrote in his Encyclical Evangelium Vitae words that are still very up to date: "It is therefore urgently necessary, for the future of society and the development of a sound democracy, to rediscover those essential and innate human and moral values which flow from the very truth of the human being and express and safeguard the dignity of the person: values which no individual, no majority and no State can ever create, modify or destroy, but must only acknowledge, respect and promote" (n. 71). To conclude, Thomas presents to us a broad and confident concept of human reason: broad because it is not limited to the spaces of the so-called "empirical-scientific" reason, but open to the whole being and thus also to the fundamental and inalienable questions of human life; and confident because human reason, especially if it accepts the inspirations of Christian faith, is a promoter of a civilization that recognizes the dignity of the person, the intangibility of his rights and the cogency of his or her duties. It is not surprising that the doctrine on the dignity of the person, fundamental for the recognition of the inviolability of human rights, developed in schools of thought that accepted the legacy of St Thomas Aquinas, who had a very lofty conception of the human creature. He defined it, with his rigorously philosophical language, as "what is most perfect to be found in all nature - that is, a subsistent individual of a rational nature" (Summa Theologiae, 1a, q. 29, a. 3). The depth of St Thomas Aquinas' thought let us never forget it flows from his living faith and fervent piety, which he expressed in inspired prayers such as this one in which he asks God: "Grant me, O Lord my God, a mind to know you, a heart to seek you, wisdom to find you, conduct pleasing to you, faithful perseverance in waiting for you, and a hope of finally embracing you". A fourth study has found links from abortion to breast cancer, claiming an abortion "triples breast cancer risk." The Priest's Secretary passes along a nice video with the icongrapher who wrote the icon of Christ the Priest, which was used by the United States Conference of Catholic Bishops for the recently concluded Year for Priests. Says Elisha to the prophet Elijah, “Please, let me kiss my father and mother goodbye, and I will follow you” (I Kings 19:20). Says an anonymous disciple to the Lord Jesus, “I will follow you, Lord, but first let me say farewell to my family at home” (Luke 9:61). The requests are the same, but the responses are quite different. The prophet Elijah answered his future and chosen successor Elisha, “Go back!” and Elisha kissed his parents goodbye (I Kings 19:20). Jesus answered his would-be follower, “No one who sets a hand to the plow and looks to what was left behind is fit for the kingdom of God” (Luke 9:62). We see, then, that what Christ the Lord said elsewhere is true, “There is something greater than Jonah here” (Luke 11:32). Jesus is indeed greater than the prophets because he is more demanding than they. When messengers from Ahaziah, King of Samaria, arrived where Elijah the Tishbite was staying, demanding he leave the hilltop upon which he sat, the prophet answered them, saying, “If I am a man of God, may fire come down from heaven and consume you” (II Kings 1:10). And so it happened. Twice. Today the Sons of Thunder, James and John, the sons of Zebedee, want to do the same to the Samaritan town that “would not welcome [Jesus] because the destination of his journey was Jerusalem” (Luke 9:53). The two Apostles said to the Master, “Lord, do you want us to call down fire from heaven to consume them,” (Luke 9:54)? Jesus shows his mercy to be greater than that of Elijah when he rebuked the Apostles and “journeyed to another village” (Luke 9:56). And whereas Elijah permitted Elisha to go back before following him, Jesus does not permit those whom he calls to return one last time; looking back from a life of discipleship to the life before is the same as rejecting Christ. Saint Basil the Great put it this way: “A person who wishes to become the Lord’s disciple must repudiate a human obligation, however honorable it may appear, if it slows us ever so slightly in giving the wholehearted obedience we owe to God” (Saint Basil the Great, Commentary on Luke, Homily 58. In Ancient Christian Commentary on Scripture, New Testament Vol. III: Luke, Arthur A. Just, Jr. et al, eds. (Downers Grove, Illinois: Inter Varsity Press, 2003, 169). The follower to whom Jesus said, “Follow me,” asked, “Lord, let me go first and bury my father” (Luke 9:59). He wanted to postpone the Lord’s invitation. His request was to honor his father, as the Lord commanded when he caused these words carved on the tablet, “Honor your father and mother, that you may have a long life in the land which the Lord, your God, is giving you” (Exodus 20:12). Though Jesus knows this command is sacred, he also knows that it is secondary to the greatest of the commandments; the duty of following Jesus in love is still more sacred. The Lord Jesus demands great things of us; he demands that we look to him above all else and let nothing keep us from him. He demands that we focus so intently on following him that we do not even look back. Why? To look back is a sign of a lack of trust and a lack of love. To look back implies that something important has been left behind. Can there really be anything better than the Incarnate love of God? Apart from the joy of loving Christ, what is there worth possessing? It is only in following the Lord Jesus in this way, without counting the cost and without looking back, that we discover our freedom. We could rightly say that the readings today invite us to reflect on the dynamic between freedom and following Christ. Saint Luke tells us, “When the days for Jesus’ being taken up were fulfilled” – think here of his Ascension to the right hand of the Father – “he resolutely determined to journey to Jerusalem” (Luke 9:51). It is in this phrase, “resolutely determined,” that we see his freedom. He knows that his crucifixion awaits him in Jerusalem; nevertheless, in obedience to the Father’s will, Jesus resolutely determined to offer his life out of love for us. “It is in his very obedience to the Father that Jesus achieves his own freedom as a conscious decision motivated by love” (Pope Benedict XVI, Angelus Address, 1 July 2007). Like human life itself, freedom draws its meaning from love. Indeed, who is freest? Someone who selfishly keeps all possibilities open for fear of losing them, or someone who expends himself “firmly resolved” to serve and thereby finds himself full of life because of the love he has given and received (Ibid.)? We often acknowledge that it is in giving that we receive, yet we hesitate to put these words into action with the totality of our lives. The Apostle Paul reminds us today: “For you were called for freedom, brothers and sisters. But do not use this freedom as an opportunity for the flesh; rather, serve one another through love” (Galatians 5:13). To live according to the flesh is to live according to my own selfish desires, to give in to my sinful tendencies. To live according to the Spirit “means allowing oneself to be guided in intentions and works by God’s love which Christ has given to us” (Ibid.). Let us, then, beg the Lord to strengthen his grace within us, that we might follow him unreservedly wherever he should lead us, confident that he “will show [us] the path to life, fullness of joys in [his] presence, the delights at [his] right hand forever” (Psalm 16:11). Amen. Football requires one to order that which is one's own to the needs of the team; it unites by means of the common objective. The success and failure of each one is based on the success and failure of the team; freedom is maintained through the order and discipline in which we learn to act together. EWTN will be rebroadcasting the Installation Mass of Bishop Paprocki Saturday, June 26 at 1:00 p.m.
To find your local EWTN channel, please click here. For more information on the Installation of Bishop Paprocki, please visit the installation website at www.dio.org/reception. The above photo is of the Papal Bull appointing His Excellency the Most Reverend Thomas John Paprocki the ninth Bishop of Springfield in Illinois. Your Eminences, Cardinal George and Cardinal Keeler; my brother Bishops, priests, deacons, men and women religious, civic officials, brothers and sisters in Christ, it is good to be with you. I have been a regular visitor to Springfield since my childhood. Those visits introduced me to our state capital and to the world of Abraham Lincoln. Now, I am no longer a visitor, and I am happy to call Springfield my new home. This day was chosen for my Mass of Reception and Installation as the Ninth Bishop of Springfield in Illinois mainly for three reasons. One is that this day was available on the calendar of our Metropolitan Archbishop, His Eminence Francis Cardinal George. This is a very important reason and I am immensely grateful not only that he officially installed me just a few minutes ago in the cathedra, the chair which is the symbol of the Bishop’s office, but also because one could say that he has been leading and mentoring me to this chair for the past thirteen years. It has been my privilege to serve him as Chancellor, as pastor of a parish, and as his auxiliary bishop for the past seven years. In so many ways he has truly been a mentor for me, teaching me how to be a bishop, providing an example of how to be a good shepherd caring for the flock of our Lord’s faithful people. Secondly, even though my appointment was announced two months ago, I needed some time to finish up my Confirmation schedule and other responsibilities, not the least of which was staying in Chicago until my beloved Blackhawks had won the Stanley Cup! Thirdly, on the liturgical calendar of the Catholic Church, today is the Feast of the English Martyrs, Saints Thomas More and Bishop John Fisher. Both of these men gave their lives in witness to the faith during the persecution of King Henry VIII. Almost alone among the hierarchy in England at that time, Bishop John Fisher demonstrated heroic courage in standing up to Henry’s rejection of papal authority. And so, St. John Fisher provides an excellent example for me and my fellow bishops of being steadfast in vindicating, defending and promoting the rights of the Church to carry out her mission as entrusted to her by Jesus Christ. St. Thomas More has also been a special patron saint for me. We have both shared the name Thomas, both have been trained and worked as lawyers, and both have held the office of Chancellor. Because St. Thomas More is the patron saint of politicians and lawyers, he is also the patron saint of many civic officials and others who work here in our state capital. So, in this liturgy today, we pray through the intercession of St. Thomas More and ask for his prayers for the Holy Spirit to guide our government officials to work for the common good and to help me to extend a shepherd’s care as they fulfill their responsibilities. In the award-winning movie about St. Thomas More, “A Man for All Seasons,” the screenplay by Robert Bolt has the following dialogue between More and his daughter Margaret. This scene takes place in the Tower of London, where More has been imprisoned for refusing to swear to the Act of Succession and take the Oath of Supremacy that would establish the King as the Head of the Church in England. MORE You want me to swear to the Act of Succession? MARGARET “God more regards the thoughts of the heart than the words of the mouth”. Or so you’ve always told me. MARGARET Then say the words of the oath and in your heart think otherwise. MORE What is an oath then but words we say to God? MORE Do you mean it isn’t true? MORE Then it’s a poor argument to call it “neat,” Meg. When a man takes an oath, Meg, he’s holding his own self in his hands. Like water. (He cups his hands). And if he opens his fingers then – he needn’t hope to find himself again. Some men aren’t capable of this, but I’d loathe to think your father is one of them. MARGARET In any State that was half good, you would be raised up high, not here, for what you’ve done already. It’s not your fault the State’s three-quarters bad. Then if you elect to suffer for it, you elect yourself a hero. MORE That’s very neat. But look now … If we lived in a State where virtue was profitable, common sense would make us good, and greed would make us saintly. And we’d live like animals or angels in the happy land that needs no heroes. But since in fact we see that avarice, anger, envy, pride, sloth, lust and stupidity commonly profit far beyond humility, chastity, fortitude, justice and thought, and have to choose, to be human at all… why then perhaps we must stand fast a little – even at the risk of being heroes. MARGARET (Emotionally) But in reason! Haven’t you done as much as God can reasonably want? MORE Well … Finally… it isn’t a matter of reason, it’s a matter of love. So, I see my primary task as bishop is to love you, more precisely, to radiate Christ’s love with the help of God’s grace throughout the twenty-eight counties of central Illinois that comprise the State of Illinois. I come to our state capital not as a sort of Catholic lobbyist, but as a shepherd of souls. But for me to radiate Christ’s love also means to proclaim His truth, since if we seek to love as He did, then we must do our best to act as He did and do everything we can to make sure that our deeds conform to His divine will to love. Pope Benedict XVI made this connection between love and truth the focus of his encyclical letter, Caritas in Veritate (“Charity in Truth”). We feel that same pleasure when we fulfill the purpose for which God made us. I believe with all my heart that it is God’s will for me to be here. Serving as the Bishop of Springfield in Illinois, I feel God’s pleasure. The second major task that I see for a Catholic bishop is to be the center of unity for the Christian community. Here, I take inspiration from Springfield’s most famous citizen, Abraham Lincoln. In his famous “House Divided” speech given on the floor of the Illinois Hall of Representatives just down the street from here in the Old State Capitol on June 16, 1858, Mr. Lincoln quoted the Bible [Mark 3:25, Matt. 12:25, Luke 11:17] in reminding people that a “house divided against itself cannot stand.” Years later, as sixteenth President of these United States, President Lincoln would make the preservation of the Union his primary focus and his lasting achievement for this great nation. So also a bishop must make every effort to be a sign of unity among all Christians and solidarity among all the peoples of this world. I look forward to visiting the towns and parishes of central Illinois and meeting the wonderful people of this diocese. On occasions such as administering the Sacrament of Confirmation, it has become customary for me to sing a song in my homily. So it is only fitting for my inaugural homily in Springfield for me to conclude this homily with a song. This song is by Brian Littrell, who achieved success as the lead singer for the Back Street Boys. Brian Littrell got his start in vocal music as a boy singing in his church choir. He now writes and performs Christian music, and he has written this song called, “Jesus Loves You.” This sums up my whole message as a bishop. It was a year ago today that we buried our friend, Coach K, who collapsed toward the end of soccer practice six days earlier. 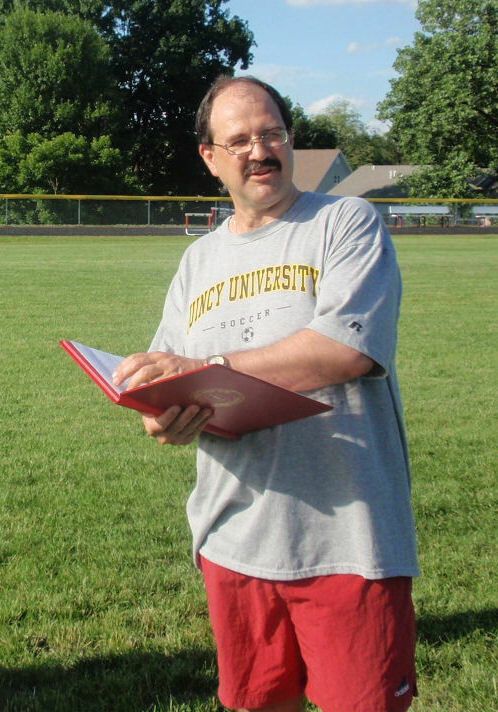 I worked with him as his "assistant coach" for the St. Anthony soccer team for only a short time, but he has left a lasting imprint on my life and I still think of him often. He was, truly, a good man, and I regret very much not having known him better. You can read the homily I preached at his funeral. I am unable to visit his grave this evening, but I will do so tomorrow evening to offer prayers for him. More photos to come throughout the day. You can view other pictures here. Arms impaled. Dexter: Or a cross throughout Azure; within the quarters four fountains, Proper, and at the center of the cross a crescent Argent. Sinister: Vert upon a Lattice Or an ogress charged with a cross patee throughout Argent; upon a chief Gules two pan-balances of the second below a heart of the third, encircled by thorns and enflamed of the second. The episcopal heraldic achievement, or bishop’s coat of arms, is composed of a shield, which is the central and most important part of the design, a scroll with a motto and the external ornamentation. The design is described (blazoned) as if the description was being given by the bearer (from behind) with the shield being worn on the left arms. Thus, it must be remembered, where it applies, as the device is viewed from the front that the terms sinister and dexter are reversed. By heraldic tradition, the arms of the bishop of a diocese, called an “Ordinary,” are joined (impaled) with the arms of his jurisdiction, in this case the Diocese of Springfeld in Illinois, that are seen in the dexter impalement (left side) of the design. For his personal arms, His Excellency, Bishop Paprocki continues to use the personal design that was adopted at the time of His Excellency’s selection to receive the fullness of Christ’s most holy Priesthood, as he was ordained as an Auxiliary Bishop for the Archdiocese of Chicago. On a green field is seen a golden (yellow) lattice, a device in which many individual slats form a single, integrated device of strength, far greater than all of its components. By the use of this device, Bishop Paprocki expresses that all aspects of Christian life, theology, church law and civil law, social involvements, form a framework of the total Christian. On the lattice is displayed an ogress (a black circular device) on which is displayed a silver (white) cross patée. The cross, which thanks to the research and knowledge of the Reverend Mister Edmund Gronkiewicz (a Permanent Deacon of the Archdiocese o Chicago) has been determined to be the “clan symbol” of the Paprocki’s family in Poland and by its use His Excellency acknowledges, with great love and devotion, the heritage that has come to him from his parents, John and Veronica (Bonat) Paprocki. The upper portion of the design, known as a “chief,” is red and contains a Sacred Heart, in silver and gold. The Sacred Heart is placed above two pan-balances, the symbol of justice and law, emblematic of the fact that Bishop Paprocki is both a civil and a church (canon) lawyer. The achievement is completed by the external ornamentation which are a gold processional cross, that is placed in back of the shield and which extends above and below the shield, and the pontifcal hat, called a “gallero,” with its six tassels in three rows on either side of the shield, all in green. These are the heraldic insignia of a prelate of the rank of bishop, by instruction of The Holy See, of March 31, 1969. This past weekend I compiled a series of Frequently Asked Questions concerning the formation of the Pastoral Unit of Holy Cross Parish in Auburn, St. Patrick Parish in Girard and of Sacred Heart Parish in Virden. Why is this happening so suddenly? The Diocesan Pastoral Plan – both as was proposed by the Office of the Chancellor (simply as a means to start a discussion) and as was proposed by the Region 12 Planning Committee from their meeting on April 28th – was presented to Sacred Heart and St. Patrick Parishes at a joint parish meeting on May 16th. Both plans were summarized in the parish bulletin on May 23rd. It was then thought that – at the earliest – the plan proposed by the Region 12 Planning Committee for one priest to be assigned to Holy Cross Parish in Auburn, St. Patrick Parish in Girard and Sacred Heart Parish in Virden would be implemented next year, or – at the latest – by the summer of 2013. The Diocese currently has fewer than 75 priests serving 131 parishes. This year 2 priests were ordained, while at the same time 2 priests retired and 1 priest took a leave of absence, whereas it was only expected that 1 priest would retire this year. This is what prompted the sudden implementation of the plan. In most cases there is a much lengthier period of time to organize the transition to a Pastoral Unit and much more information being shared in advance. In this situation, there was not time for such planning and coordination and many of the necessary decisions and structures are still being examined. Has the Diocese had this plan in mind all along? No. The Diocese has had several options under consideration, none of which were definitely decided upon. Even the proposals to arise from the 2010 Diocesan Pastoral Plan – which continues to be formed in the other eleven regions – was to come not from the Diocese but from the regions themselves. Why is Father moving to Auburn? The Diocese of Springfield in Illinois, in view of the current circumstances, will not grant permission to build the new rectory that was being planned, nor will permission be granted to renovate the current rectory in Virden. Doing so, when there is an empty rectory in Auburn that is in good condition and has been maintained over the years, would make little financial sense and would be a poor stewardship of parish goods. Why are there not two Sunday Masses in Virden or in Auburn? The universal law of the Church permits a priest to celebrate no more than three Masses for Sundays, either on Saturday evenings or throughout the day on Sunday itself; Bishop Lucas extended this permission to celebrate not more than four Masses for Sunday when the need should arise This permission was not intended to become routine, though in certain cases it has become so. From time to time, Father Daren can celebrate four Masses for a Sunday, but his stamina will not allow him to do so on a regular basis, especially in the winter months; therefore, each parish has one Mass each weekend for a total of three Sunday Masses. Why are only three Masses celebrated to fulfill the Sunday obligation in the three parishes? The answer is the same as above: The universal law of the Church permits a priest to celebrate no more than three Masses for Sundays, either on Saturday evenings or throughout the day on Sunday itself; Bishop Lucas extended this permission to not more than four Masses for Sunday. From time to time, Father Daren can celebrate four Masses for a Sunday, but his stamina will not allow him to do so on a regular basis, especially in the winter months; therefore, each parish has one Mass each weekend. If we had four Masses each weekend, could we not have a retired priest celebrate one of the Masses on a regular basis? Our retired priests are aging and many of them are unable to drive; those who are able to drive are often scheduled in parishes many months in advance, particularly over the summer months. There would be no guarantee that a retired priest could be secured for each weekend of the year, making this idea, though a good one, not a viable option. Why is the weekday Mass in Virden? The weekday Mass is in Virden because of the size of congregations for daily Masses. In Auburn, two or three people attend daily Mass; in Pawnee, up to eight people attend daily Mass; in Virden, between nine and twenty-five people attend daily Mass depending on the day of the week; Girard does not have a daily Mass. It does not make a great deal of sense to celebrate Mass for a couple of people when many more are waiting in another location. Why is the weekday Mass not celebrated on a rotation between the churches? A rotating Mass schedule – for weekdays or weekends – almost always results in a decrease in Mass attendance across the board. Most people simply will not take the trouble to determine where Mass is celebrated on a given day and go there. Why is there no Mass in Sacred Heart church in Divernon? Sacred Heart church in Divernon is not handicapped accessible and poses a possible risk to those who would attend Mass there, many of whom are elderly. The church is also the smallest of the four churches in the pastoral unit and would likely not be able to hold the size of a congregation that would be expected between three Masses. All things being equal, an average congregation would consist of 198 persons; Sacred Heart church in Divernon seats only 125 persons. When and where will Masses be celebrated for the Holy Days of Obligation? What about Christmas, the Triduum and Easter? These schedules are yet to be determined. Will we have a common bulletin? At least in the beginning, the parishes will retain separate bulletins, though common information will be shared. Whether or not we move to a common bulletin remains to be seen. How will religious education be provided? Each parish will provide its own religious education for children this coming year, be it CCD or PSR. The hope for the future is to have the three parishes coordinate together for these classes so as not to duplicate each other and to combine our efforts for a greater and more effective religious education. How will we pay for staff? How will we fund ministries and programs? The shared costs of the parishes will be proportionately distributed between them. Holy Cross Parish will provide 40%, Sacred Heart Parish will provide 35% and St. Patrick Parish will provide 25%. Each parish will be responsible for the costs of its buildings, with the exception of the rectory, which will be a shared expense. What will the new PSR and CCD schedule for Holy Cross Sacred Heart Parishes be? Holy Cross Parish will likely hold PSR following the 8:30 a.m. Mass and Sacred Heart Parish will likely hold CCD before the 10:30 a.m. Mass. These details have yet to be arranged. What will be done with the old rectory in Virden? At this point, it is not certain what will be done with the rectory in Virden. Assuming Diocesan approval, it will likely be sold. The Diocese would prefer us not to rent property because of the liability concerns associated with it. Sacred Heart Parish does currently rent a home to [name here withheld], which we will continue to do. What will happen with the plans drawn up for a new rectory? The plans for a new rectory in Virden will be kept to perhaps be in used in the future in Virden or elsewhere. If I normally put a loose check (not in an envelope) in the collection basket, how will I know if it goes to the right church? The collection counters at each of the parishes will be instructed and advised to keep a careful eye out for checks written to other parishes and envelopes placed in the collection from other parishes. Using your parish envelopes will greatly help in these efforts; if you place your envelope at another parish, you consider circling your name and parish on the envelope with a marker to help the collection counters spot it. What is the size of each of the parishes? Why was there no consultation from the parishioners in this plan? While it is true that there has not been an open forum discussion toward the plans, it is not true that there has been consultation in the plans. As once announced in the bulletin on March 14th, I asked Greg Maynerich and Tony Rothering from Sacred Heart Parish and George Hart and Mike Walter from St. Patrick to sit on the planning committee. When the plan was presented to the Parishes on May 16th we asked for concerns, comments and suggestions. In the bulletin of June 13th, it was again said that concerns, comments and suggestions could be given to the members of the planning committee; none of the members received any calls. Who are the representatives from the parishes? Steve Baker and Dave Miller represent Holy Cross Parish; Greg Maynerich and Tony Rothering represent Sacred Heart Parish; and George Hart and Mike Walter represent St. Patrick Parish. We must sincerely and continuously beg the Lord for more priests! Ask yourself these questions: When was the last time I truly prayed for our priests? When was the last time I truly prayed for more vocations to the priesthood? When was the last time I actively encouraged a young man to consider the priesthood? My dear brother Bishops, priests, deacons, men and women religious, civic officials, ecumenical and inter-faith leaders, brothers and sisters in Christ, it is a joy to be with you this evening. On this eve of my Installation as the Ninth Bishop of Springfield in Illinois, I am pleased that you have come to join me in prayer asking God to help me to carry out my new responsibilities. I look forward to spending time with you, getting to know you, listening to you and learning how to be a good Bishop for you. Last week I attended the Special Assembly of the Bishops of the United States, which addressed the topic, “The Bishop as Agent of Hope for His Priests.” I hope to be such an agent of hope for the priests of the Diocese of Springfield as a father, a brother and a friend to you. I welcome the ecumenical and interfaith leaders that are here with us. I am hopeful that we fellow Christians can find ways to work towards Christian unity to fulfill the prayer of our Lord and Savior, “That all may be one” (John 17:21). I look forward to collaborating with leaders of all faiths to promote the virtues of religion and the values that we hold in common. I welcome the many government and civic leaders present here this evening. My major field of study in college was political science, I enjoy reading about Abraham Lincoln, and I am licensed to practice law in the State of Illinois. Those personal traits give us some things in common, but I come to you not as a political scientist, or lobbyist, or lawyer, but as a shepherd of souls. As such I seek first and foremost to have a pastoral relationship with you, and help to guide you in that most important relationship of all, our relationship with God. Some of you here this evening have known me for years. For many of you, however, this may be the first time that you’re hearing from me directly and you might be wishing to know more about me. Normally I don’t like to talk about myself in a homily, but I would like to give you some idea of the person who will be the new Bishop of this diocese. So I would like to fill in some of those blanks for you not so much by talking about myself directly, but by talking about my heroes and other people who have greatly influenced my life and have helped to shape the person that I am today. I will do so not in any particular order of importance or chronology. First, I would like to tell you about a dream that awoke me in the middle of the night during the summer of 2002. I remember it precisely because I don’t normally remember the details of my dreams, yet this one still sticks clearly in my mind. On a July night in 2002 while I was Pastor of St. Constance Parish on the northwest side of Chicago, the late John Cardinal Cody appeared to me in this dream. Cardinal Cody was a significant figure in my life for a number of reasons. He was appointed Archbishop of Chicago in 1965. A year later I began our high school seminary, Quigley South, and so he was my Archbishop throughout the next twelve years that I spent in our seminary system at Quigley, Niles College Seminary of Loyola University and Mundelein Seminary. Cardinal Cody ordained me both to the diaconate and to the priesthood. He was my Archbishop for the first four years that I served as a priest. I had never dreamt about Cardinal Cody previously and have never dreamt about him since that summer of 2002. So what was so significant and memorable about Cardinal Cody appearing in this singular dream? Well, in this dream, Cardinal Cody not only appeared, but he had a message for me. He said that he had come to tell me that I would be a bishop. Not only that, but he also told me where: Cardinal Cody said that I would be Bishop of Madison, Wisconsin! Right idea: state capital, wrong state! OK, so God’s messengers apparently don’t always get their facts straight! (Sort of like my predicting that the Blackhawks would beat the Philadelphia Flyers in five games to win the Stanley Cup, while it actually took them six!) The fact is that the core of the message turned out to be true, as just seven months later, in January 2003, Pope John Paul II appointed me Auxiliary Bishop of Chicago. Cardinal Cody’s successors also had a profound impact on my life. After Cardinal Cody died in 1982, he was succeeded by Cardinal Joseph Bernardin. Shortly before he arrived in Chicago, I had completed law school at DePaul University College of Law and had co-founded the South Chicago Legal Clinic with my classmate and friend, Ed Grossman, as a way to help provide legal services for the poor. So I went to tell Cardinal Bernardin about this project, since it was a rather unusual ministry for a parish priest. He gave me his blessing with the reminder that, as a priest-lawyer, the priest always came first. I have remembered that injunction to this day. It was Cardinal Bernardin who named me Vice-Chancellor, then sent me to Rome to get my doctorate in canon law at the Pontifical Gregorian University, and then made me his Chancellor. It was my privilege to serve him and the Archdiocese in this capacity as canonical advisor until the day he died in November 1996. Cardinal Bernardin was succeeded by Cardinal Francis George in 1997 and I continued as Chancellor until the end of my second term in June 2000. Then Cardinal George gave me permission to spend that summer studying Polish language and culture in Cracow, Poland. Shortly after my return, he appointed me Pastor of St. Constance Parish, a large Polish-American parish on the northwest side of Chicago. These were very happy years in direct parish ministry serving the people of God. A major change came in January 2003 when Pope John Paul II appointed me to serve as Auxiliary Bishop of Chicago and Cardinal George assigned me as his Episcopal Vicar for Vicariate IV, overseeing a region of the Archdiocese. Cardinal George also made me his Liaison for the Polish Community in Chicago as well as Liaison for Health and Hospital Affairs. For the past seven years it has been my privilege to collaborate closely with Cardinal George and my fellow Auxiliary Bishops. We worked well together and I learned a lot from these experiences. As a Polish-American, for me the most significant person in the hierarchy of the Church was our great Holy Father, Pope John Paul II. He was elected Pope just five months after my ordination as a priest and he would serve as Pope for the next twenty-seven years of my priesthood, so obviously he had a great influence over my life and ministry. I am blessed that the Papal Letter appointing me Bishop in 2003 bears his signature. In my homilies over the past seven years on the occasion of the installation of a new pastor, I have recommended a theme suggested by our Pope John Paul II in his Apostolic Letter, NOVO MILLENNIO INEUNTE, “On entering the New Millennium,” which I quote as follows (nos. 30-31): “First of all, I have no hesitation in saying that all pastoral initiatives must be set in relation to holiness. . . . To ask catechumens: ‘Do you wish to receive Baptism?’ means at the same time to ask them: ‘Do you wish to become holy?’ It means to set before them the radical nature of the Sermon on the Mount: ‘Be perfect as your heavenly Father is perfect’ (Mt 5:48)”. As a bishop of the new millennium, I pledge myself to this goal, that all pastoral initiatives be set in relation to holiness, and I will urge the pastors of this diocese to collaborate with me in working towards that goal. • To live our Catholic Faith by practicing charity and justice. These four goals fit well with Pope John Paul II’s call for all pastoral initiatives to be set in relation to holiness, and so it is my intention to continue to follow this Diocesan Pastoral Plan. Of course, the story of those who have influenced my journey of faith must refer back to the beginning with my parents. My Dad, John H. Paprocki, Jr., was a pharmacist. Before finishing pharmacy school and marrying my mother, Veronica, he served as a pharmacy technician in Army hospitals in Europe during World War II. Prior to that, he was in the seminary, graduating from Quigley and attending Mundelein Seminary until he discerned that the Lord was not calling him to be a priest. Of course he didn’t know at the time that his vocation was to be the father of nine children, one of whom would someday be standing here as your new bishop. Dad was a quiet man, but he spoke volumes with his actions. He taught his family what was important by where he took us. In order of frequency and importance, they were: St. Casimir Church, which was our parish church one block away from where we lived; the homes of our aunts, uncles and cousins; the second balcony of the old Chicago Stadium, home of the Chicago Blackhawks; and Comiskey Park, home of the Chicago White Sox. Oh yes, there were occasional visits to Wrigley Field to see a curiosity known as the Chicago Cubs! Dad died in 1997 at the age of 76, but I still count on his prayers and intercessions to guide me in matters that are really important in life. My mother, born Veronica Bonat, is a person that I call an intentional Catholic. What I mean by that is that her parents were Catholic but never had her or her younger brother baptized. So when she was thirteen years old, she took her brother Eugene by the hand and together they walked up to the rectory at St. Casimir Parish, rang the doorbell and told the priest they wanted to be baptized. After receiving instructions in the faith, they were baptized, and the priest who instructed them kept in touch with our family for years after that until the day he died. His name was Father Stanley Rokicinski, whom we called Father Rocky for short. He was the first priest that I got to know personally and he was a real inspiration for my vocation. My mother tells me that I was about four years old when I started talking about wanting to be a priest, largely due to the impression that Father Rocky had made upon me as a young boy. Because of this, I am very aware of the importance of good role models for influencing the lives of young people. The picture would not be complete without telling you about some of the figures who influenced my decision to study law. When I was eight years old, a Catholic by the name of John F. Kennedy was elected as President of the United States, the first Catholic to hold the highest office in our country. His campaign and his presidency got me interested in politics and government. So as a student at Loyola University I majored in political science and eventually decided that I would study law at DePaul University to acquire a tool for ministry that would put action behind the words of concern for justice. It was as a student in eighth-grade that I first visited our state capital and became familiar with Springfield’s most famous citizen, Abraham Lincoln. Just a few years later, a similar field trip when I was in high school deepened my admiration for our sixteenth President. Since that time, I have read a number of biographies about Mr. Lincoln from various perspectives: Lincoln and religion, Lincoln and the law, Lincoln and his family, Lincoln and his cabinet, etc. He is for me one of the most fascinating figures of all time, and I am thrilled to be living just down the street from the Lincoln Presidential Library and Museum in the same town where he lived and worked for over twenty years and where he is buried. The sentiments expressed by President Lincoln at the conclusion of his Second Inaugural Address on March 4, 1865, just days before his death, set a tone that I wish to emulate as I begin my ministry here in central Illinois: “With malice toward none, with charity for all, with firmness in the right, as God gives us to see the right, let us strive on to finish the work we are in.” As St. Paul put it, “May God who has begun this good work bring it to completion” (Philippians 1:6). I would like to conclude with some words of praise and thanksgiving for all the wonderful people that have shaped my life over the years and have been instrumental in guiding me to my greatest hero of all, our loving and merciful God. God's will, I pray thee, wish not one man more. . . .
And rouse him at the name of Crispian. . . .
Come, go we in procession to the village . . .
That God fought for us. . .
Do we all holy rites.